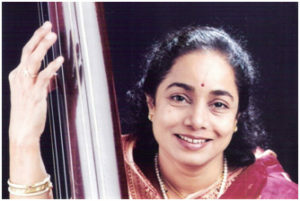 Prof. Shruti Sadolikar-Katkar was born into a family of musical tradition on 9th November, 1951, in Kurundwad, Kolhapur. She is a scholar, performer and teacher par excellence of the Jaipur-Atrauli gharana of khayal vocalism. She was initiated into raag-sangeet by her father, Wamanrao Sadolikar (who himself was a disciple of the legendary Alladiya Khan and his son, Bhurji Khan). He remained her primary guru till his death. She also received taleem from Gulubhai Jasdanwalla, another disciple of Alladiya Khan and his son, Manjhi Khan, from 1968 till 1990. From him she received many rare ragas and bandishes. She also imbibed a few old thumris from him. She then went on to seek further guidance and knowledge from Azizuddin Khan (son of Bhurji Khan, and grandson of Alladiya Khan) and continued to do so till his death in 2011. Shruti Sadolikar-Katkar is one of few exponents of pure Jaipur gayaki, having trained under eminent gurus of the gharana. She is considered as an authority over the ragas and bandishes of this style of music owing to her rigorous training and her extensive reading and scholastic approach towards music. Besides khayal, she is also well-versed in other forms of vocalism, viz. Thumri, Tappa, Natya Sangeet, Bhajan, etc. She has also done extensive reading and research on Haveli Sangeet, and sings them in their authentic form. Bhulabhai Memorial Institute Fellowship, 1975. Kesarbai Kerkar Scholarship by N.C.P.A., 1976-77, 1977-78. Homi Bhabha Fellowship by the N.C.P.A. from 1994 to 1996 for the comparative study of ‘Pushti Sangeet of Nathdwara and Kankroli and The Khayal Singing of the Jaipur-Atrauli Gharana’. Sangeet Natak Akademi Award given by the Government of India in 2011. ‘Gifted Women Of The World’ released and marketed by Noa perfume, Paris. ‘Shanmukha Sangeet Shiromani’ – the First National Eminence Award for Music by the Shanmukhanada Sageet Sabha, 2002. Gopinath Savkar Prize for contribution to the Marathi Sangeet Rangabhoomi, given by the Akhil Bharatiya Marathi Natya Parishad. Talpade Memorial Prize by the Rangasharada Pratishthan for best direction for the production of the play ‘Sangeet Tulsidas’, in 2001. Pendharkar Prize by the Akhil Bharatiya Natya Parishad for best music direction, for the play ‘Sangeet Tulsidas’, 2001. Dagar Gharana Samman for achievements in the field of music by the Maharana Mewar Foundation of Udaipur, 1998. Sangeet Shiromani Award by the Kashi Sangeet Samaj Benaras on 22nd April, 2008. Shruti Sadolikar-Katkar earned the Sangeet Visharad degree from the Akhil Bharatiya Gandharva Mahavidyalaya and a master’s degree in music from the SNDT Womens’ University, Mumbai. A thesis on Haveli Sangeet – a type of temple music, has been published by her. She revived the play ‘Sangeet Tulsidas’ after almost 60 years to pay homage to her father, who had played the role of ‘Tulsidas’ in the original in the 1930’s. She produced and gave music to the play, and it won 5 awards. She currently is the vice-chancellor of the Bhatkhande Music Institute Deemed University, Lucknow. She has published several musical and educational recordings. An ‘A-top Grade artist’ of the All India Radio and Doordarshan, Shrutiji has also participated in all the major Music Conferences in the country and abroad. She has been a visiting Professor to the Rotterdam Conservatorium, Netherlands and has given various lectures and demonstrations in many Universities in India, USA, UK, Canada and France.